On May 12, Ruby Hill neighbor Brandy Moe was presented with the Keep Denver Beautiful “Outstanding Community Service Volunteer” award for her contributions toward keeping Denver clean and beautiful. At the annual Community Service Awards dinner, Brandy and recipients of other Keep Denver Beautiful awards were honored for their work in the community. Neighborhood residents may be familiar with Brandy from the Ruby Hill Facebook group where she often posts helpful resources and events occurring in and around our neighborhood. She also serves the community by contacting local officials for updates on the improvements going on in Ruby Hill Park and surrounding trails and bike paths, which she then shares to keep everyone informed. Additionally, Brandy has participated in several public meetings for local improvement projects, representing the Ruby Hill neighborhood’s interests in connectivity and walkability. Her volunteer work—while much valued by the Ruby Hill neighborhood—is not confined to this area of Denver alone. She volunteered on a monthly basis with Reading Partners Colorado for several years, reading with elementary school students. “It’s a really well structured program. I loved it.” She’s also contributed her time to other Colorado non-profits like the Center for Resource Conservation and Zuma’s Rescue Ranch. Brandy champions environmental issues such as xeriscaping and urban farming, and serves as a leader for the Ruby Hill Community Garden. She has been instrumental in getting Ruby Hill’s community garden connected through Denver Urban Gardens and eligible for grants and other assistance. And she enjoys passing on the knowledge she learns. “As a Denver Master Composter I have taught tons of classes and helped folks set up compost areas in their backyard,” Brandy said. Brandy’s impact doesn’t stop at helping to keep neighbors informed about local issues; she also has inspired others with her trash collecting challenge. It started spontaneously. “I spotted a plastic bag hanging from a small tree as I walked up the northern most sledding hill,” said Brandy. She freed the bag from the tree and then filled it with trash as she walked. 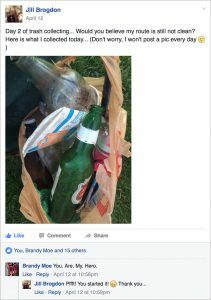 She posted a picture of the trash she’d collected on Facebook, encouraging neighbors to do the same. Others took up the challenge, posting their pictures of the garbage they’d collected, actively participating in improving their neighborhood. 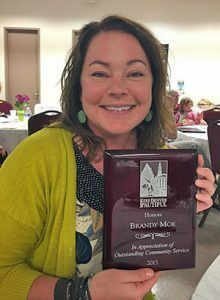 Join me in thanking Brandy Moe for all she does in and around our neighborhood, and in congratulating her on this well-deserved recognition! The path is technically still under construction so the trail surface will be improved from what you see out there currently. The trail was originally designed to be an entirely natural surface trail, which means the organic material on the surface is removed and the mineral soil below is the finished surface of the trail tread. Where the trail is located in irrigated blue grass areas we realized there may be a problem with the trail surface becoming muddy from the irrigation. So, in the blue grass areas we decided to surface the trail with a sand gravel mixture. A lot of the gravel material still needs to be properly compacted. All of the trail outside of the blue grass areas will remain natural surface. The width of the trail will vary from approximately 3’-4’ wide. The trail will not be made any wider than what you see out there currently. When the trail was being constructed, the trail builder ran in to many pockets of debris from dumping that occurred on the site decades ago. This debris has to be treated as suspected of containing asbestos which means it has to be cleaned up as if it does contain asbestos. This process is labor intensive and very expensive. As a cost savings measure we chose to narrow the width of the trail to avoid further excavation that may uncover more debris. Although walking or running side by side is an enjoyable way to use a trail we just can’t accommodate that on this trail. We anticipate the loop trail will be completed by the second week in June. As part of the finish work, any remaining sod will be removed from the tread surface, any weeds sprouting up will be sprayed, gravel areas will be compacted, and the tread surface will be smoothed out with a slight pitch to drain water. As far as the homeless folks are concerned, I will reach out to our ranger staff and the Denver Police to be sure they are aware of the situation. For the thistle, I’ll reach out to our natural areas team to be sure Ruby Hill is on the weed mitigation list. And lastly (be most certainly not least!) I will reach out to our volunteer coordinator to see how we can keep you and the volunteers engaged at Ruby Hill. You are our most valuable asset, the parks simply can’t stay in great shape without you! As you know, so many of us at Ruby Hill have been looking forward to a walking/running path that outlines the perimeter of the park. We are excited to see forward movement this spring and are anxiously anticipating the path to be completed. I have walked the path many times, but have hesitated to run on it, because the gravel is still a bit loose and uneven in some areas. I have noticed many bikes on the path and the cyclists really seem to be enjoying it. The path, at this stage, is more like a mountain trail than a walking/running path. I see that additional sod has been removed along the portion of the path that exists closest to the houses on Quivas. Will more work be done to level the path or to widen it? As it is, you cannot walk two people side-by-side and its unevenness is not conducive to walking or running. The portion of the path east of the baseball fields is gravel-less and the sod is not cut out very well. Will your team be attending to this length of the path within the next month or so? The portion of the path that runs through the north side of the park, winding through gorgeous trees, is really allowing park goers to experience a part of Ruby Hill Park that is not usually very accessible. I love it. I have three concerns about that length of path. 1) a bunch of Canadian Thistle is growing throughout that area and should probably be sprayed is considered a noxious weed. 2) there are quite a few folks sleeping under trees in this part of the park, leaving their cardboard mats behind. 3) this portion of the path is also gravel-less. Also, please let us Ruby Hill’ers know how we can help. We love our park and do our best to clean up the seemingly endless amount of trash and other little duties. I am the garden leader at the Ruby Hill Community Garden and we love being good stewards of our park, as well. We would love to pitch in. Hi Brandy, below is a comment I sent to Jolon Clark and Ken Sondgerath about the Ruby Hill Loop Trail. I live about a block away from Ruby Hill Park. I run on the loop trail (the part that is currently open) in the mornings and my kids swim in the pool and play in the park regularly. I love the park. My family and I are very much looking forward to the Leavitt Pavilion opening next year. Your teams have done a great job! Question about the loop trail: Can you make it wider? I attended some of the planning meetings for the park 2 years ago and it was explained to me that the trail would be like the Wash Park and Cheeseman Park loop trails, which are very pedestrian friendly and wide enough for runners and families to use and walk side by side. It kind of seems like you made this loop trail to cater to mountain bikers and trail runners, when in reality what Ruby Hill park needs is one big wide trail to accommodate everyone. The mountain bikers have the mountain park they can use. People out for a walk want a nice, wide gravel path they can traverse (and not have to walk single file). These types of paths drive huge amounts of traffic, year round. If widening the entire trail is not an option here is a suggestion: Widen the newly created eastern and western portions only and get rid of the dog-legs. Those stretches are flatter and widening would not take much effort. That way a group of walkers could traverse along the already -wide Florida and Jewell sidewalks (as they traverse east and west), and then hop on the newly widened portions to travel North and South (from Florida to Jewell and/or Jewell to Florida on both sides of the park).